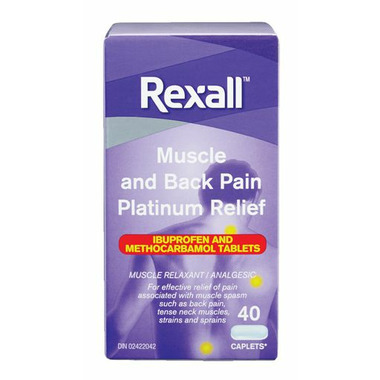 Rexall Muscle and Back Pain Platinum Relief is a muscle relaxant for effective relief of pain associated with muscle spasm such as back pain, tense neck muscles, strains and sprains. Dosage: Adults: Take 1or 2 caplets every 4 to 6 hours as needed. Maximum daily dose: 6 caplets in 24 hours.